This after dinner talk about one of the most sensational figures in show business will reveal little known facts of the life of this master showman. 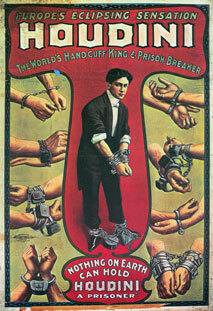 Hear amazing tales of Harry’s life as a vaudeville magician, his conversion to escapology, his challenge escapes, his Court trials, his flying and film making careers and his sensational crusade against spiritualism. Gasp at the income generated by one of the greatest self-publicists of all time. During the course of the talk you will hear Harry and Bess speak from beyond the grave. An incredible life packed into 52 short years.